When were were in Korea, I remember seeing street vendors selling sweet pancakes or hotteok. They are a crispy on the outside, doughy on the inside, sweet brown sugar syrup filled delight. 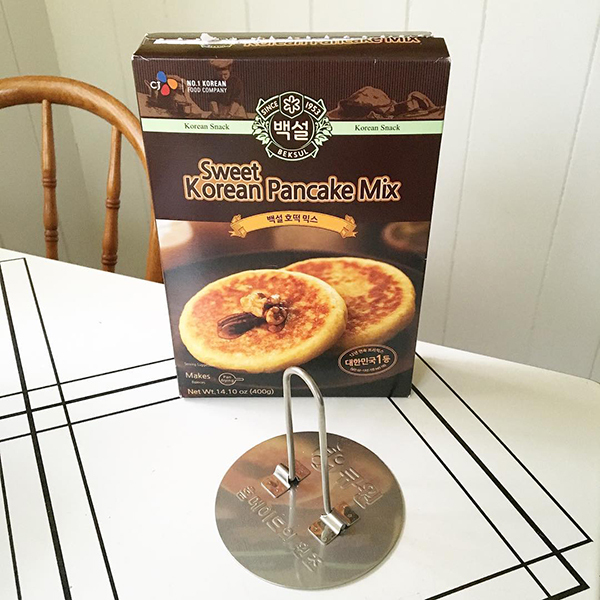 I thought about making some from scratch, but then I spied this box of mix at the Korean grocery store and it seemed the way to go. Plus it came with the handy dandy pancake squasher tool pictured above. They were easy to make and I put the squasher to good use. They are supposed to be a snack food but we had them for breakfast. Really can't go wrong with sweet and yummy for breakfast. Love it! Thanks for the share.